Beau Dietl & Associates has assisted in developing the most comprehensive, secure, and cost effective modern construction projects. Members of our team have conducted risk assessments and security evaluations of corporate headquarters, industrial facilities, office buildings, shopping centers, medical and residential housing, and private residences. We have also developed corporate security plans and specific countermeasures, incorporating quick response and cost effective solutions. Many members of our team have solid, extensive backgrounds in law enforcement and have successfully performed as managers with unique criminal justice expertise. As a result of this operational background, we enjoy a close working relationship with a distinguished cadre of security professionals around the world. This security expert network maintains a knowledge base of security and threat related information which is critical to provide global servicing of our clients needs. BDA has secured the development of the new Yankee Stadium, and the properties of clients such as The Witkoff Group, AdellCo, CNY, Tishman Construction, Hertz Corporate headquarters, Sapir Real Estate Development, TriStar Capital, Flag Luxury Miami World Center and many more. Not only will BDA bring the best possible security programs to your site, but we keep the programs current by staying on top of changes in technology, such as explosive and trace detection systems, biometrics, and computer networking. These developments in technology are ever changing and throughout the life of the project are reviewed to ensure whenever possible the most advanced technologies are deployed. BDA remains on the forefront when it comes to threat detection, intelligence, and deterrence from around the world. 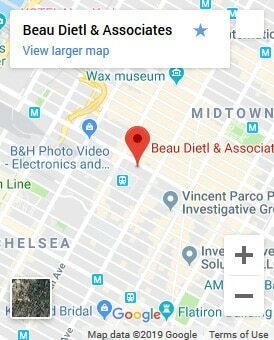 We believe the key to our success is the communication and synergy between the Beau Dietl & Associates team, management and staff, architects, construction company, and the appropriate local, state and federal agencies. Working with your architectural firm, the BDA team will explore the most current best practices used in the security field and develop and comprehensive security blueprint.